I received my order from Handcrafts Online. Mary Kathryn sent these out so fast! I love the colors in this one and I love the fabric Mary Kathryn picked out! I can't wait to get these all stitched up. I think they would look so pretty all displayed in a basket. I'm almost done with the front. I think it's going to be pretty cute once finished. I'm determined to get the finishing done right away too. I still need to get my Happy Day needleroll finished. I've avoided that for too long! Well, not much else going on here. Just kids with a little work and stitching thrown in! :) Write later! 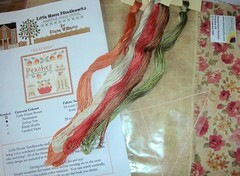 The fabric for Peaches is perfect! The colors match amazingly! And your fob is coming along nicely, can't wait to see it finished! 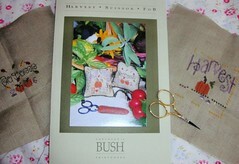 Aw, I just love your Harvest Fob - what a cutie - I can't wait to see it all finished up soon! I've got peaches too, but no fabric. I must look it out and perhaps I'll find where I hid watermelon at the same time *sigh* It's not with the others.